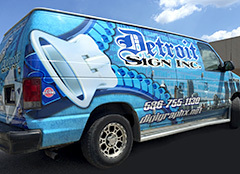 Digigraphx Company and Detroit Sign, Inc.
We make no claim to have the rights to the trademarks of the companies that we customize our products on behalf of you and your clients. All customization is done at the behest of the purchaser and by using our services you agree to indemnify Digigraphx Co. from any and all claims to trademark infringement that may arise. In addition, unless communicated to us previously in writing, you also grant us the right to retain images of any items produced for any marketing or promotional material we may elect to produce. Copyright © 2018 Digigraphx Co. All Rights Reserved.